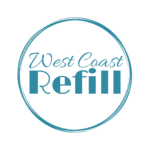 West Coast Refill – Environmentally friendly, bulk and refillable cleaning products for your home and body. Zero Waste essentials. Please visit our new location now open at 1319 Broad St.
Refill with everyday home and body care products. 1.Bring in your clean, empty bottle or container. 2. Our staff will tare the weight of your empty container. friendly products for your home and body.